About the property Exclusive To Beaux Villages! Very large property of 4/5 houses with 13 rooms on 571m2, 10 km from Bergerac airport. Complex of 3 rental cottages and another to be restored with a valid building permit. A swimming pool. 3 barns, one of which is about 400 m2 in very good condition. Bel Immeuble à bergerac centre ville, composé de 2 appartements (d'un T3 et d'un duplex, libre ) ,et d'un grand local de 130m² (loué). proche commerces. 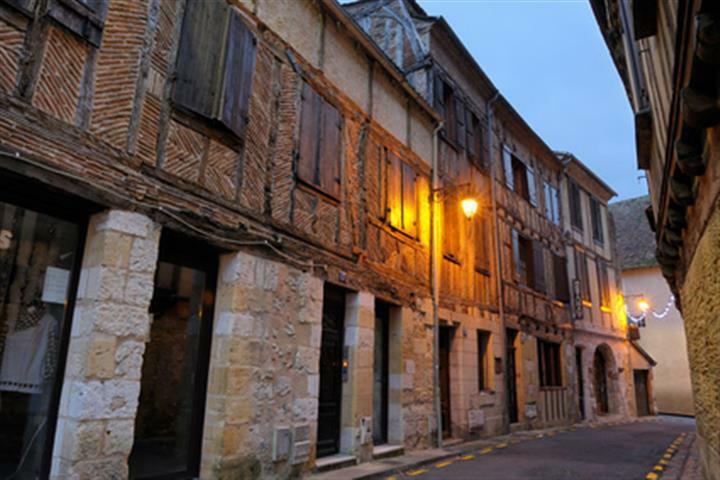 Half-timbered houses in Bergerac, Aquitaine City of art and history located on the banks of the Dordogne, Bergerac is a fair sized town where life is good. Blessed with all the necessary infrastructure for easy living, it's a lively town where people love to laugh and eat. The gastronomy is fabulous: poultry foie gras, truffles ... all, of course, washed down with a country wine because Bergerac is a wine-making hotspot. And lovers of old stone buildings can be assured: its historic town centre contains small architectural gems. If all this tempts you, take note that the real estate market in Bergerac and surrounding region has lots of properties for sale, many at very reasonable prices. You can choose between building plots, apartments, of course, but there are houses of all styles: townhouses, stone houses, contemporary villas, prestigious residences ... And why not buy a vineyard too?